In a small bowl, mix the lemon juice with the salt until the salt dissolves. Stir in the oregano. Slowly whisk in the olive oil and season generously with pepper. 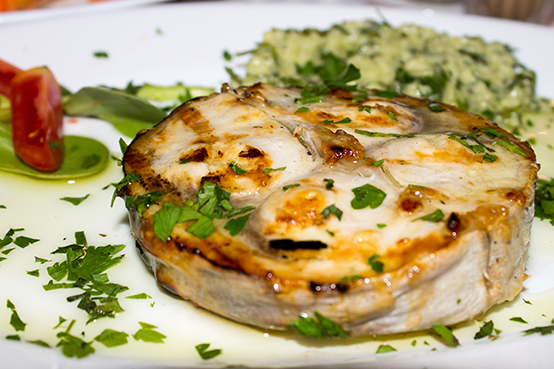 Grill the swordfish steaks over high heat (as close to the heat as possible), turning once, until cooked through, 6 – 7 minutes. Transfer the fish to a platter. Prick each fish steak in several places with a fork to allow the sauce to penetrate. Using a spoon, beat the sauce, then drizzle it over the fish. Serve immediately. Serves 4.